Unlike the last three coups in Fiji, the latest coup has been supported by sections of the Fijian left. Also, the Australian and NZ left has been strangely silent, in marked contrast to their vocal criticisms in 1987 and 2,000. Some leftists are supporting the coup, because the Qarase government was pro-Western and was attempting to institute pro-indigenous racist land policies. However, China may also be a factor in left backing for the coup. The crypto-communist, pro-Chinese, Fiji Labour Party is likely to benefit under the new government. Former Labor Prime Minister, Mahendra Chaudhry, has given tacit support to the coup. The leader of the Fiji Labor Party, Mahendra Chaudhry, told Radio New Zealand in an interview... stressed that he was not ready to be part of an interim government to be formed by the military but was "ready to extend any help that we can in order to bring about the restoration of democratic rule". Coup leader and new Prime Minister, commodore "Frank" Bainimarama is pro-Chaudhry and attempted to re-install him in early 2006. From The World Today 18th May, 2006. Fiji's Military Commander has given up his push to stop the newly-elected Government of Fiji led by Laisenia Qarase from taking power. Commodore Frank Bainimarama had been trying to convince two Independent MPs to join the Fiji Labour Party to instead put Mahendra Chaudhry back in as Fiji's Prime Minister. 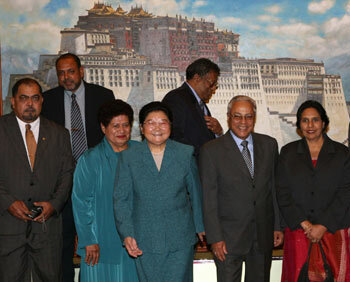 A life long supporter of Marxist causes, Chaudhry visited China in December 1999 and led a Fiji Labor Party delegation to Beijing as recently as late October 2006. Gu Xiulian, vice chairwoman of the Standing Committee of the National People's Congress of China, the country's top legislature, on Wednesday met with a delegation from the Fiji Labor Party. The delegation was led by party leader Mahendra Chaudhry, former Fijian prime minister. Gu said that the Communist Party of China would like to step up cooperation with the Fiji Labor Party. Coup leader, Commodore "Frank" Bainimarama is also known for his strong pro-Beijing views. Fijian military dictator Frank Bainimarama says he will seek support from China and other Asian nations if Australia continues to campaign against his leadership. Commodore Bainimarama said he assumed China "would always be there" to support Fiji. "We have always had close ties with Beijing," Bainimarama told The Weekend Australian newspaper. "I've already made an official visit there at the invitation of the People's Liberation Army and we've had two senior officers at China's defence college since 2000." Will Beijing be the only beneficiary of the turmoil in Fiji? Utter rubbish in my opinion. I do not believe there is any connection. If you judge relationships by the number of visits, then Qarase has a much better relationship with the Chinese then does Chaudhry. Although the article linked above refers to the US and Australia stances, parallels can be drawn with the NZ position. However, China had its problems with the Qarase government, which afforded Taiwan’s Chen Shuibian the opportunity to pay an unofficial visit spring 2005 that included a friendly greeting at the airport, meetings with the Fijian Vice President and other bigwigs, and apparently, an unannounced meeting with Qarase. You want to suggest that folks like us should blindly trust China's "peaceful" rise?